WASHINGTON — President Donald Trump's announcement of an unprecedented public health emergency Thursday to combat opioid and drug abuse drew both praise and concern from public health advocates. Many said the move, while a positive first step, risked undercutting the enormous financial requirement to launch an effective response. In an East Room speech, Trump called the crisis a "national shame" and declared his intention to “quickly move to implement approximate and appropriate measures” to address the epidemic. Describing it as a “plague,” he vowed to crackdown on drug distributors and traffickers, and to work with state and federal agencies to lure people away from the temptation to take drugs and opioids. He pointed to his upcoming trip to Asia next month, saying that he’d discuss working with Chinese President Xi Jinping to crackdown on Chinese-made fentanyl shipments. Trump pledged throughout his 2016 campaign to make the opioid crisis a priority as president, and established a commission in June to address the problem, which Trump said killed 64,000 Americans last year alone. Just since he first suggested that he would declare a national emergency to attack the crisis on Aug. 10, some 10,700 Americans have died from overdoses, according to the commission’s estimates. Instead, Trump’s presidency has brought an aggressive push for new healthcare legislation that guts funding to Medicaid, the primary source of coverage for mental health and substance use disorders. That prompted Republican senators from hard-hit states to propose separate funding of $45 billion to absorb the blow, a figure receiving pushback from some within the administration. The declaration alone provides no additional money to combat the problem but allows existing grants to be redirected to better deal with the crisis. Declaring an emergency under the Public Health Services Act gives the Health and Human Services secretary wide discretion to respond by accessing the Public Health Emergency Fund, which only has about $57,000 left. The secretary can also waive typical Medicare and Medicaid rules temporarily or access the national stockpile of medications. “Funds will be critical,” said Rebecca Haffajee, Assistant Professor of Health Management and Policy at the University of Michigan School of Public Health. "Congress will need to appropriate more money” given the shallow resources available under the Public Health Emergency Fund. A series of scandals now leaves the Trump administration without a health and human services secretary or a drug czar, the two posts best positioned to tackle this crisis. The commission itself will disband after it issues a major report on the crisis next week. From the start, the president’s commission to combat drug and opioid abuse made clear that the ball was in Trump’s court. “The first and most urgent recommendation of this Commission is direct and completely within your control,” its members wrote in August in an interim report addressed to the president, calling on him to declare a national emergency. Its assessment was grim. Approximately 142 Americans die every day from drug overdose — more than those killed in gun homicides and car crashes combined. The report added that more than 27 million people reported current use of illegal drugs or abuse of prescription drugs in 2015. Working-class whites, who supported Trump in record numbers, have been among the hardest hit. “You, Mr. President, are the only person who can bring this type of intensity to the emergency and we believe you have the will to do so and to do so immediately,” it said. The president’s declaration Thursday will, among other things, allow for expanded access to "telemedicine" services, something the White House describes as important in dealing with a crisis that is concentrated in rural areas across the United States. First Lady Melania Trump will spearhead the White House’s efforts to combat addiction. The administration’s stalled response to the crisis has come under increased scrutiny following a joint CBS "60 Minutes" and Washington Post report revealed that Trump’s appointed drug czar, Rep. Tom Marino, R-Pa., accepted nearly $100,000 from the pharmaceutical lobby while sponsoring a bill that made it easier for drug companies to distribute opioids across America. Marino withdrew his name from consideration, but the president has since come under fire to deliver on his promises to tackle the nation’s ever-growing opioid scourge, even from members of his own commission. Declaring a federal emergency of either kind would ultimately unlock access to funds under the Public Health Service Act or the Stafford Act. A public health emergency can only last for 90 days, but can be extended by the Health and Human Services Secretary. A state of national emergency — the more aggressive of the two — comes with greater executive power to waive Medicaid regulations and laws that might slow the government’s response. The plan to announce the public health emergency was first reported by USA Today. The road to this declaration has been long and bumpy. Delays and infighting have plagued efforts by the commission itself, including short staffing and poor planning, one person familiar with the details said. Officials say former Health and Human Services Secretary Tom Price and Budget Director Mick Mulvaney has pushed back on higher funding for drug and opioid treatment, creating tension with commission members. Other crises emerged beyond the administration’s control — namely the three hurricanes that have battered the U.S. this year. The president was scheduled to hold drug and opioid-focused rallies in New Hampshire and Ohio, but the hurricanes derailed those plans. The commission’s chairman, New Jersey Gov. Chris Christie, praised the president’s declaration Thursday. He had previously said that the delay in a declaration was counterproductive. “You can't get those two months back,” the Associated Press reported, citing Christie. “And so it's not good that it hasn't been done yet." As a candidate, Trump proposed a plan to tackle opioid abuse, which included a promise to increase access to naloxone, the overdose medication, ramp up the Food and Drug Administration’s approval of abuse-deterrent painkillers and boost treatment options at the state and local level. Lawmakers from both parties have expressed concern over the little progress to date to help combat this issue at a state and local level. The commission’s report, scheduled for release on Nov. 1 — one month behind schedule — will serve as a roadmap for Trump and his administration to deliver on many of his campaign promises. While declaring a public health emergency in itself cannot reverse a crisis of this magnitude, the commission argues that it can empower the Cabinet to take bold actions, awaken Americans to the enormity of the epidemic and, perhaps most significantly, force Congress to focus on funding. Sen. Rob Portman, R-Ohio, one the leading voices on Capitol Hill working to combat this growing epidemic, said last week that declaring a state of emergency would prompt government agencies to collaborate in the drug and opioid fight. “It’s not about throwing money out to the issue, it’s about finding out what works,” he said. While Trump’s efforts to repeal and replace Obamacare have been stymied on Capitol Hill so far, every GOP-backed legislative effort he’s supported so far would involve significant cuts to Medicaid, the primary source of coverage for mental health and substance use disorders. Senate leadership is pushing to add $45 billion to the Republican health care bill for opioid addiction treatment — an amount many lawmakers and health care professionals say is only a drop in the bucket. Kennedy says that at least $200 billion over 10 years is needed for any effective response. As for the commission, the group will be disbanded when it produces its final report, but its members say they will vote next week on an important accountability recommendation to make sure the White House and Congress are following through with their promises long after their work is complete. 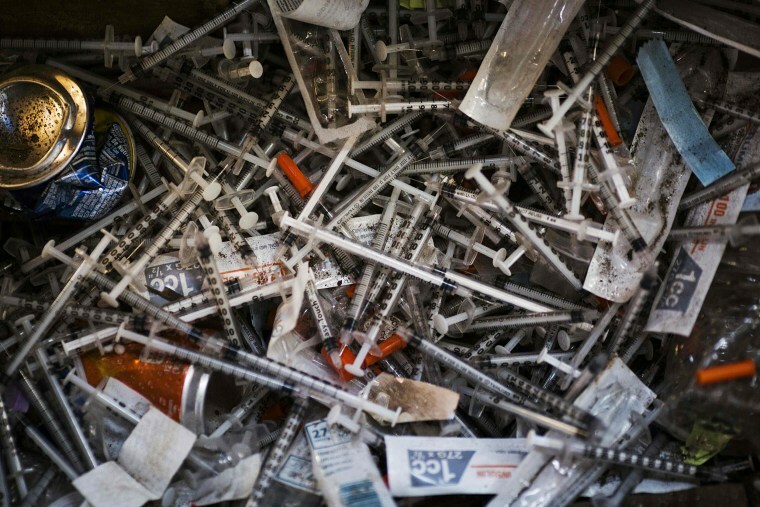 “Smart policy says you have to have accountability,” said Harvard Medical School Professor Bertha Madras, a member of the commission and former official with the White House Office of National Drug Control Policy. “There are a lot of treatment issues that are far more complex than just budget numbers and those are the issues that will require a real commitment from the administration,” she said.